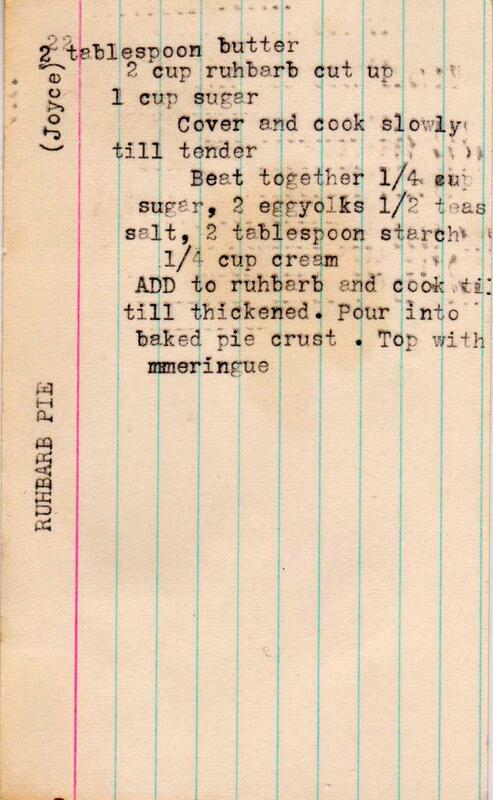 Just when I was thinking that there was nothing new under the spring sun for rhubarb desserts, I encountered this wonderful vintage recipe. Unlike most rhubarb pie recipes, where the rhubarb remains chunky, this creates a smooth filling (think applesauce, only with rhubarb). 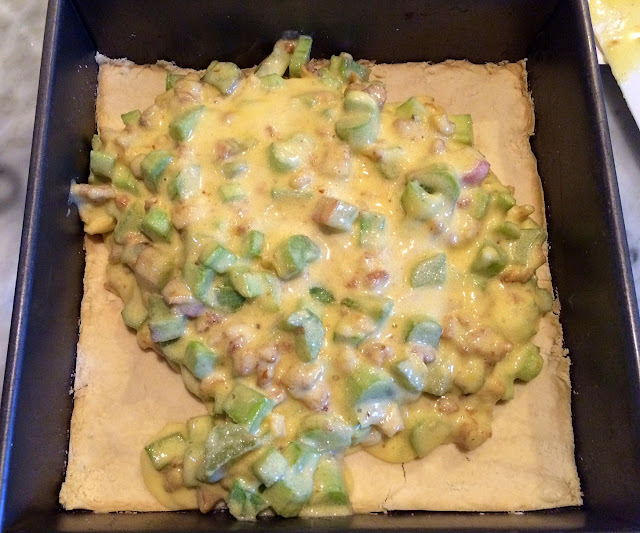 The filling is cooked first, then poured into a baked pie crust. Let's get started. 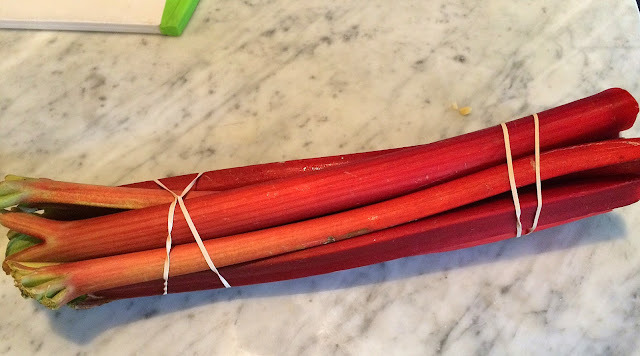 The rhubarb I used was purchased at the Ann Arbor Farmer's Market (couldn't resist the ruby red stalks) and flown back in my carry on luggage. 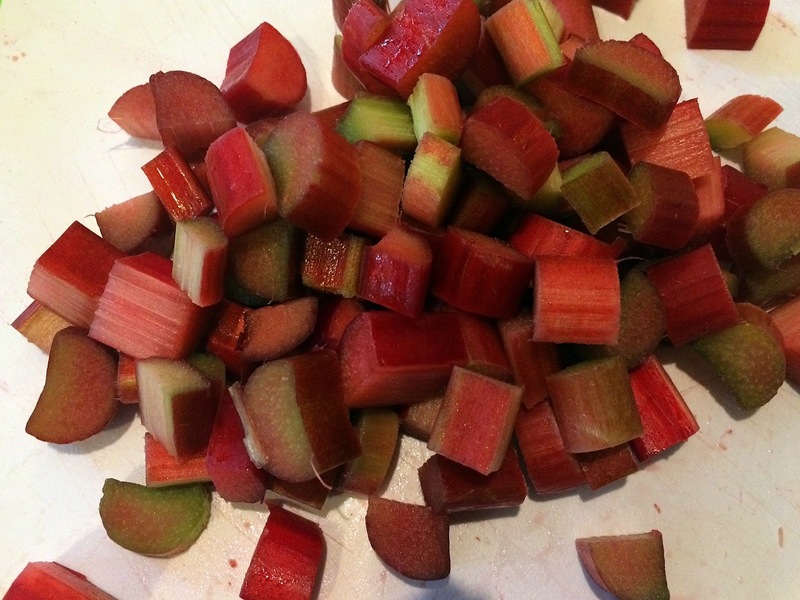 Cut the rhubarb into small pieces. You'll only need two cups, which was about three very large stalks. 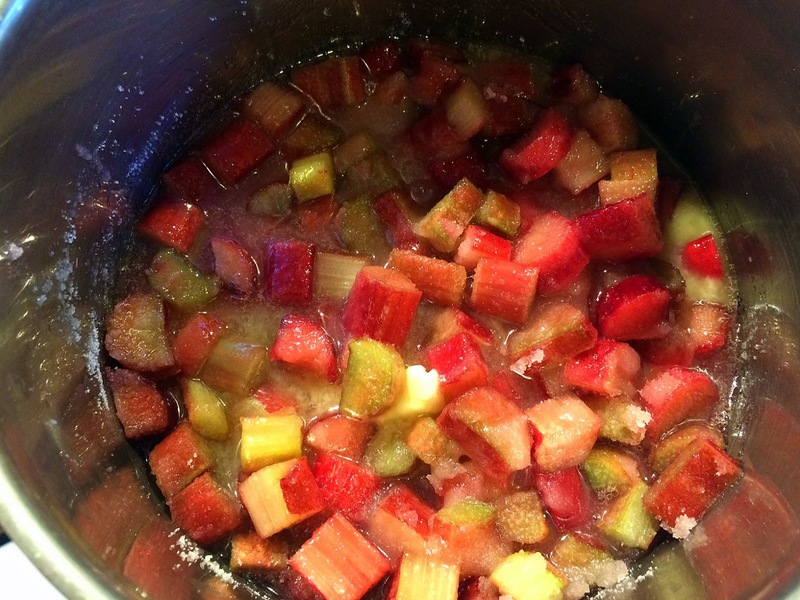 Place the rhubarb in a two-quart (or medium size) saucepan, add sugar and butter. Cover and cook for about ten minutes, until the rhubarb chunks disappear. 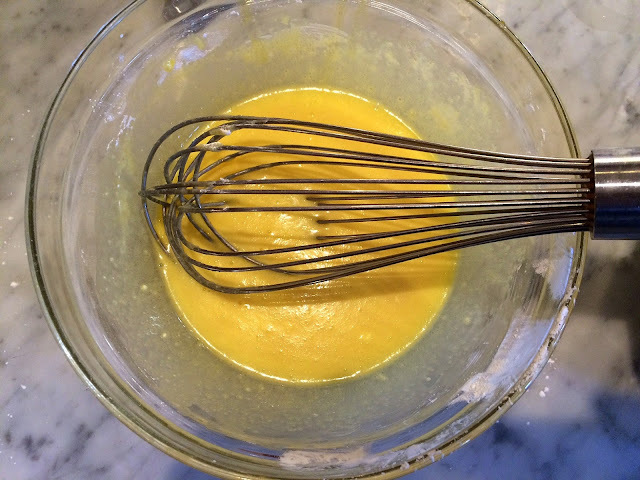 Mix up the filling sauce -- egg yolks (reserve the white for the meringue), cornstarch, sugar, salt and heavy cream. Temper it (warm it up) by adding some of the hot rhubarb liquid to it before pouring it in the saucepan to prevent scrambled eggs. Cook this mixture until it's thick. Pour the filling in the pie crust. 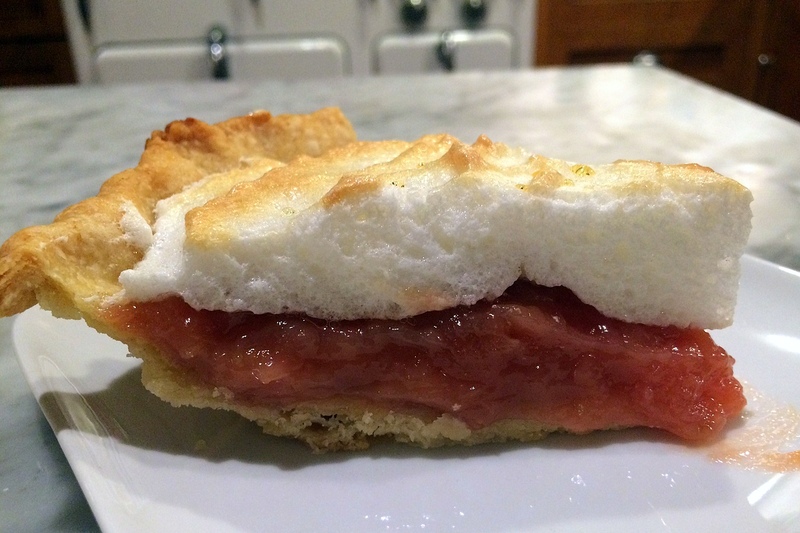 It was not a super generous amount, typical of mid-20th century recipes, but with the meringue, it will fill out nicely. 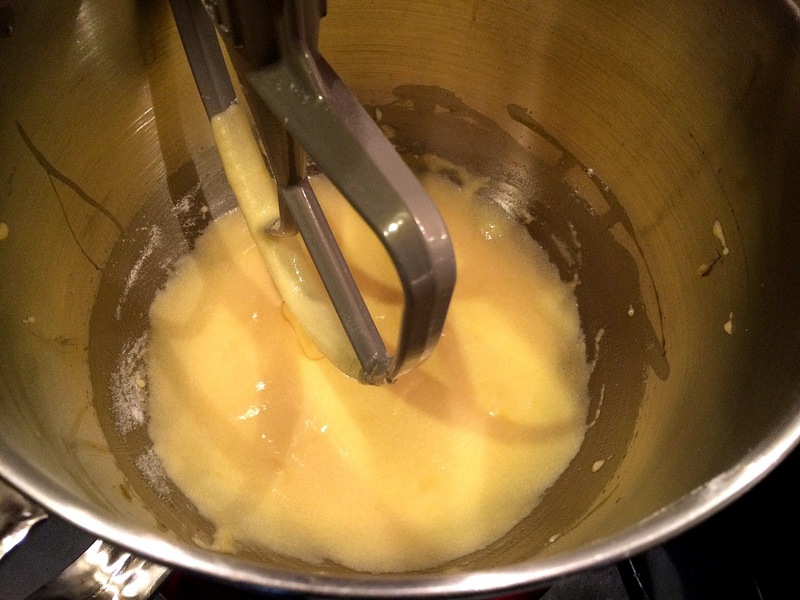 Make the meringue (the right way!) with the reserved egg whites and add on top of the filling. Bake about ten minutes in a 350 F oven to brown the top. Production notes: I followed the recipe exactly, but have written it out since the card is a bit confusing. Place rhubarb, 1 c. sugar and butter in saucepan. Cover and cook until soft. The rhubarb will break down. In a small bowl, combine egg yolks, 1/4 c. sugar, salt, cornstarch and heavy cream. Whip to combine. 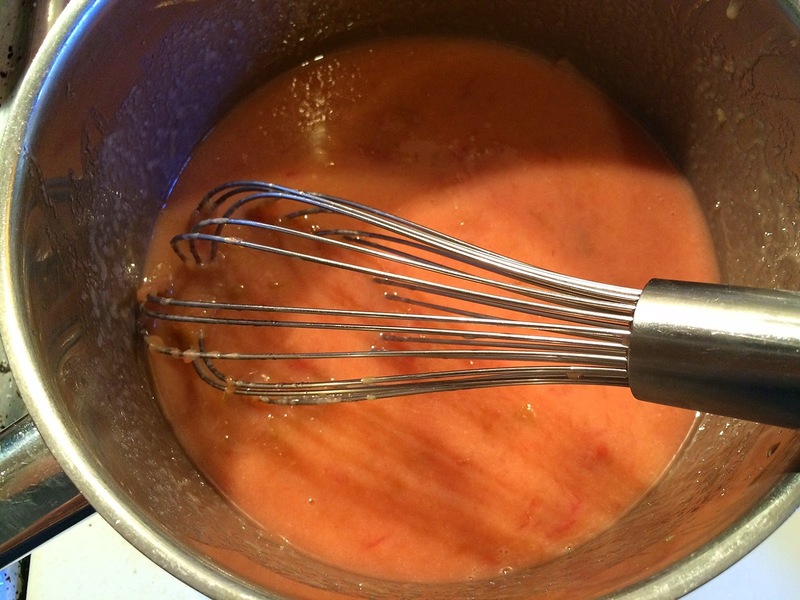 Add a few tablespoons of the hot rhubarb mixture to the cream mixture, and stir to combine. Add the cream mixture to the saucepan while stirring. Make meringue with reserved egg whites. 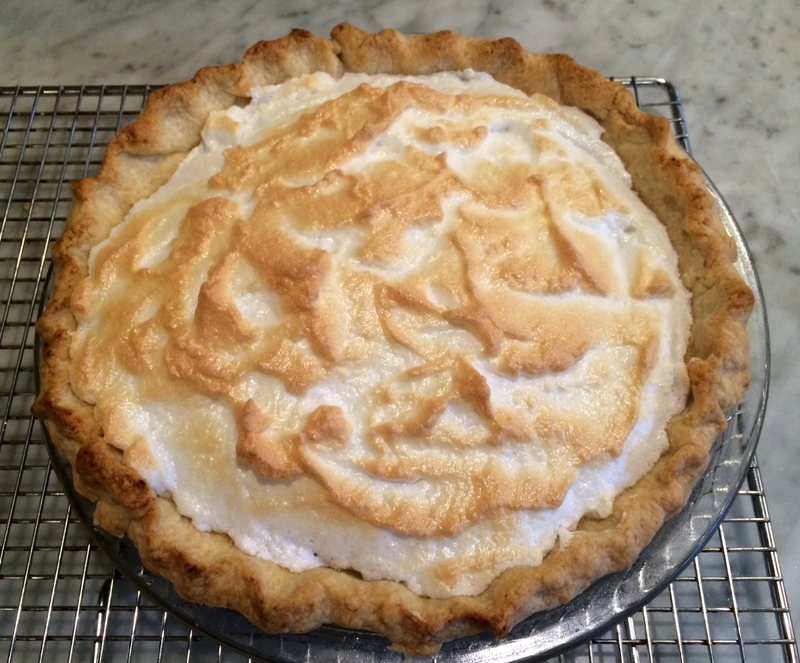 I screwed up the meringue, making it from memory, rushing as our dinner guest was ringing the doorbell! Look up a recipe to find a good one. One way to prevent overbeating the whites is to add a bit of cream of tartar to the mixture at the beginning, a step I skipped. 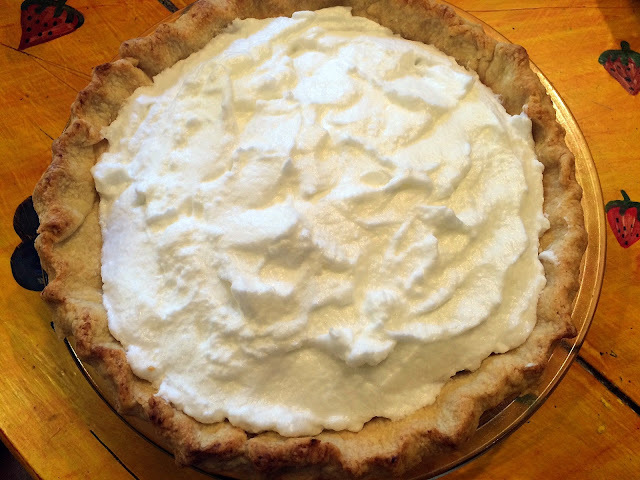 Just be sure to seal the edges of the pie with the meringue to prevent weeping. Bake the pie for ten to 12 minutes in a 350F oven, just to brown the meringue. Place dry ingredients in a food processor and whirl to blend. Add butter and Crisco and process until it resembles cornmeal. Add the water, a couple of tablespoons at a time, through the feed tube, mixing just a second or two after each addition. Remove from the bowl directly into a plastic bag and smoosh it all together. 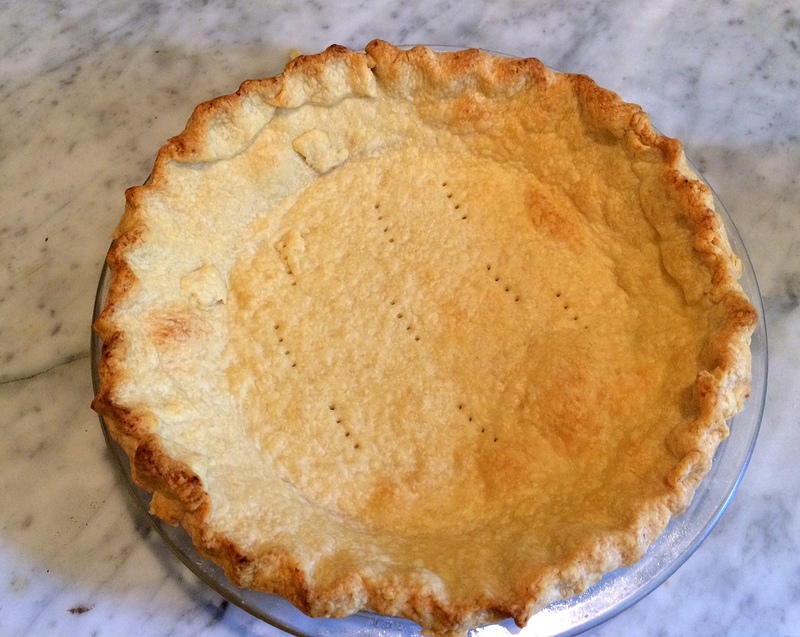 To blind bake it, roll out about half the dough into a circle and transfer into a pie plate. Crimp the edges. (Reserve the other half for your next pie) I roll the dough between two sheets of plastic wrap. Keep the top layer of plastic wrap on the pie (I do this with Costco wrap) or line it with aluminum foil. 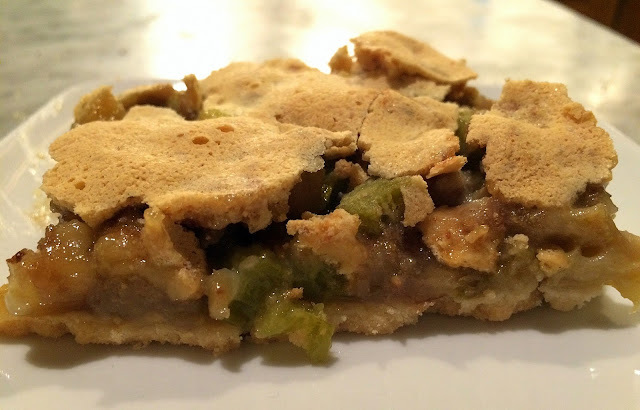 Fill the center with pie weights of dry beans and bake in a 425 F oven for ten minutes. Remove the lining and weights, prick the bottom with the tines of a fork and return to the oven for about ten minutes until it is lightly browned. Note: If you have time, refrigerate the crust before baking for at least an hour to help retain the crimping on the edge. 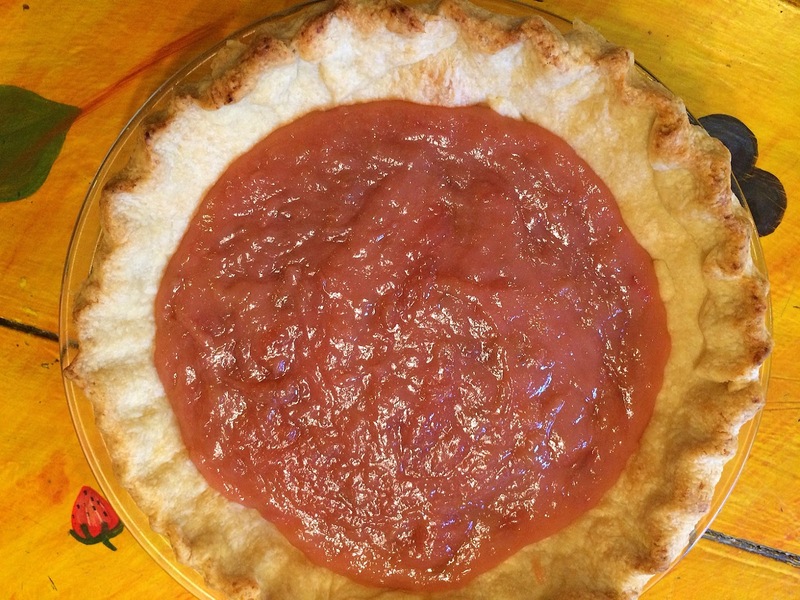 I've made (and blogged about) a lot of rhubarb desserts over the past five years. You can find them here (custard pie) and here (steamed) and here (muffins) and here (bread) and here (pie) and here (cake) and here (crunch) and here (pudding). 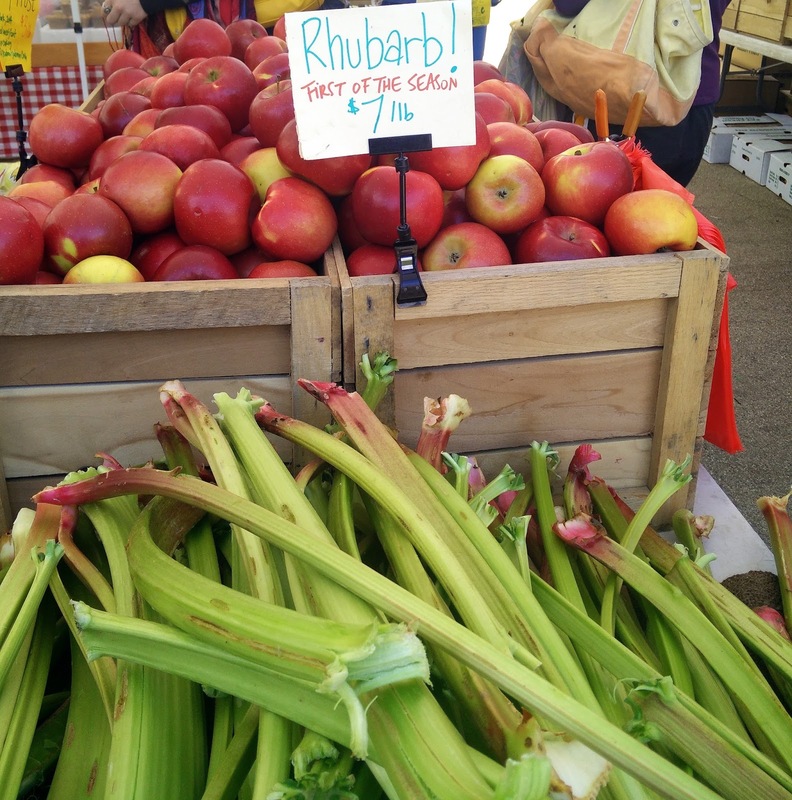 It's one of the first local vegetables to appear in early spring at the farmer's market, and there are a lot of vintage recipes for rhubarb in my collection. I'm figuring that mid-20th century housewives felt the same excitement -- something fresh! -- and that it was relatively inexpensive and extremely versatile. 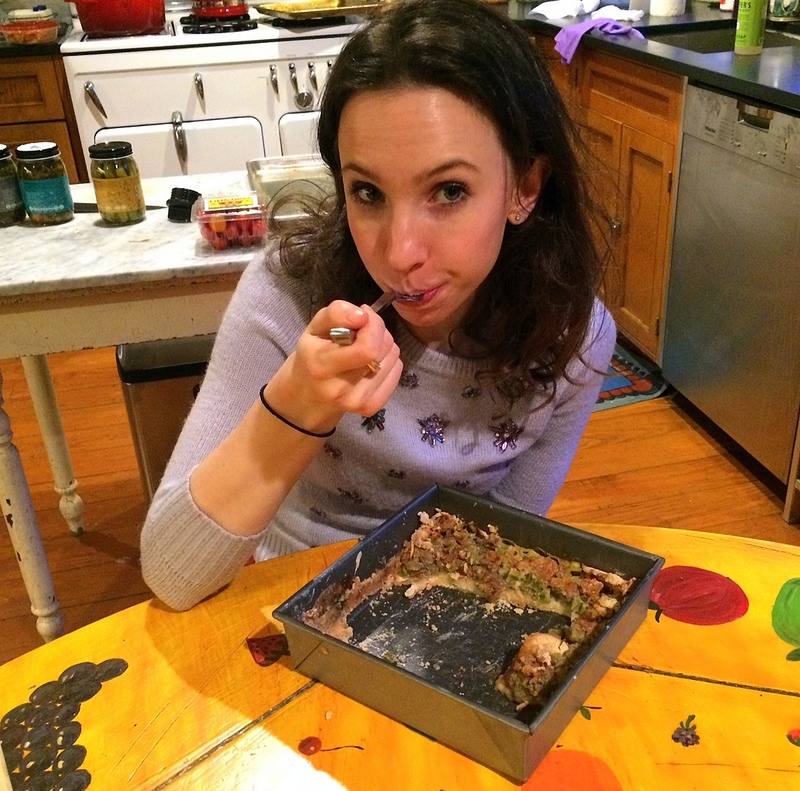 Rhubarb Torte was a bit of a failure, and hardly blog-worthy or so I thought -- until the DD came for a visit and couldn't stop eating it (see below), all the time insisting that she doesn't like rhubarb. Go figure. This rhubarb torte (like most rhubarb desserts) is a delightful combination of sweet and tart. The batter forms an almost meringue-like topping and the combination of walnuts and rhubarb is really, really good. 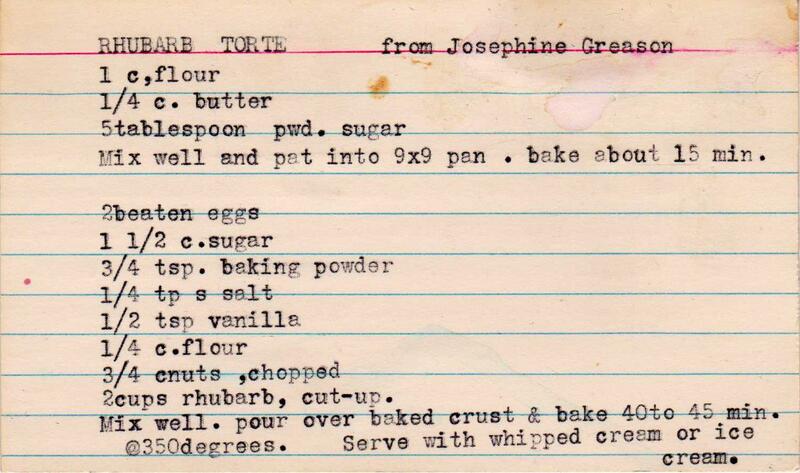 I'm bringing you this recipe with some caveats. Mostly, the crust has the taste and mouth feel of cardboard and you need to "sling" the pan (line it with parchment or aluminum foil overhanging the sides so you can lift the torte out of the pan before cutting). Otherwise, base cements itself to the pan and you'll practically need a chisel to remove it. That's a bit of an exaggeration, but not much. 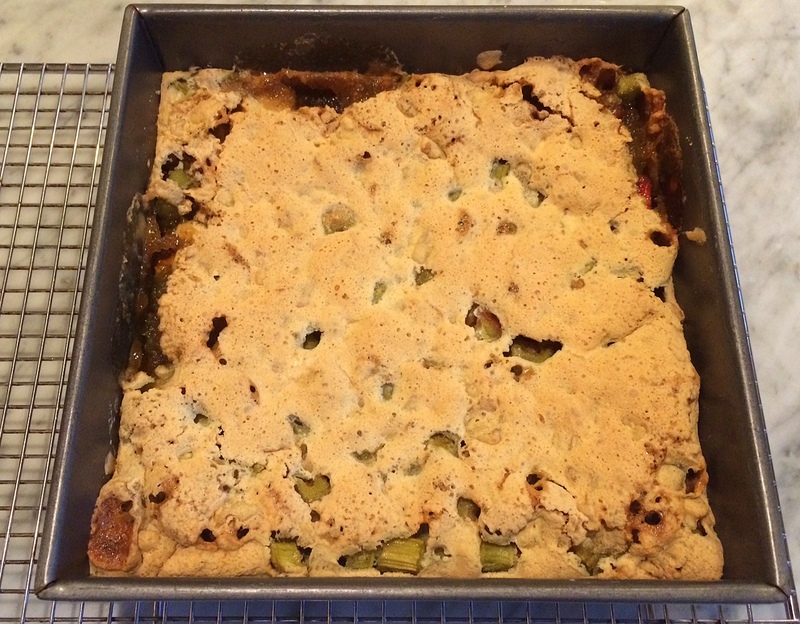 The first rhubarb of the season is green; a bit later the stalks are red. 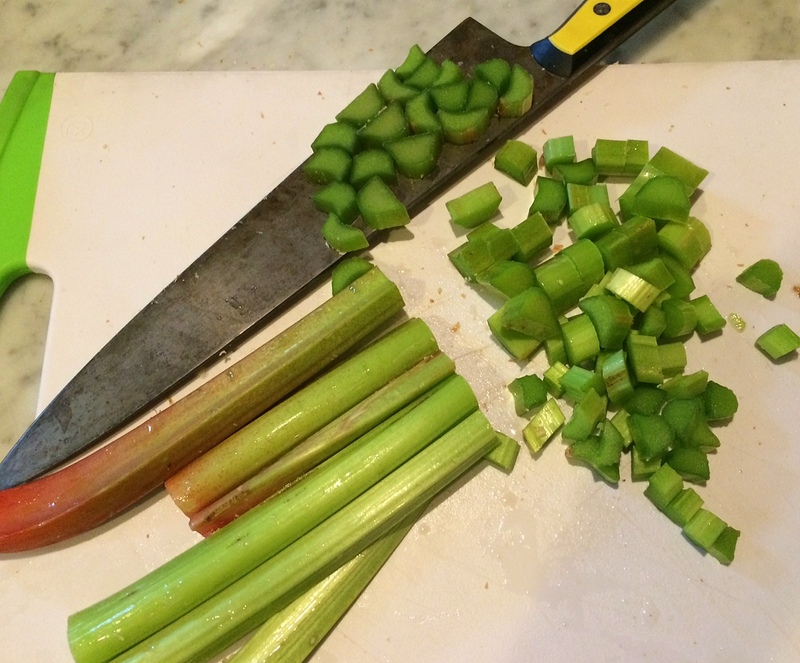 So this looks like celery, but trust me, you don't want to eat it without first cooking it with sugar. 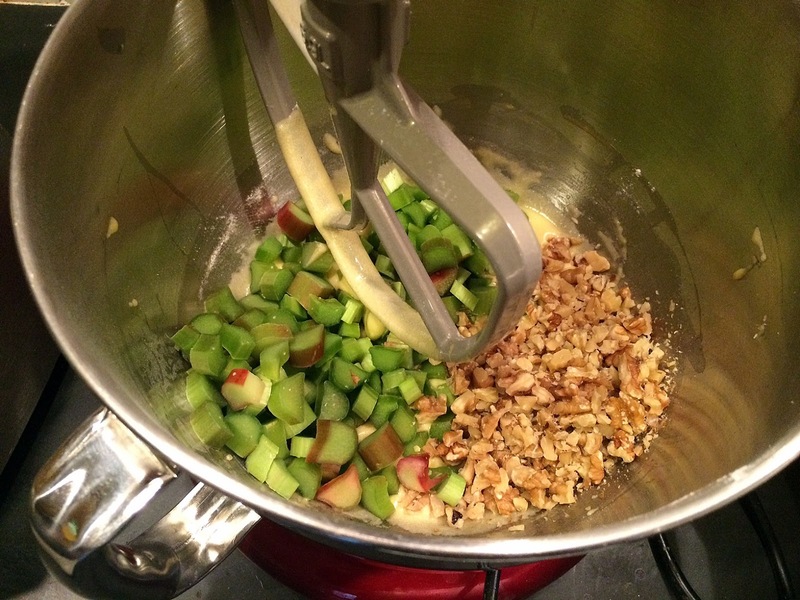 And add in the nuts and rhubarb. Pour the mixture over the base (see more on that below) and using an offset spatula or butter knife, smooth until it reaches the edges of the pan. Bake about 40 minutes. The fruit will be bubbling at the edges and the top will be a light golden brown. 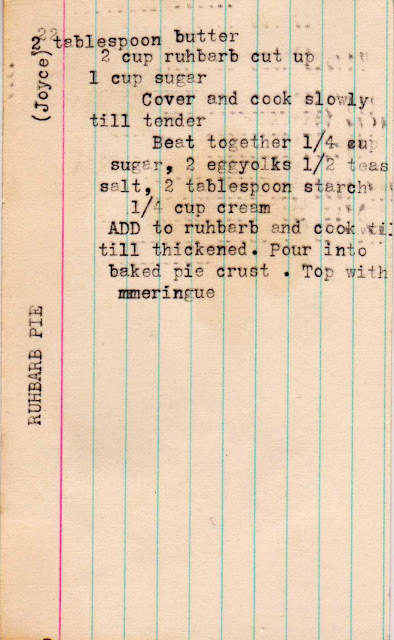 Production notes: Replace the base with a pie crust dough and bake with pie weights (or dry beans) for about 10 to 15 minutes. 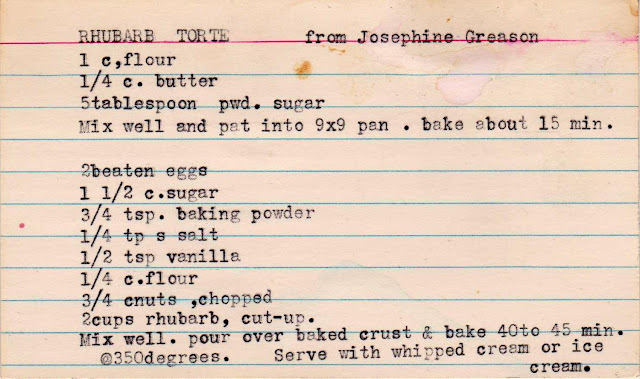 Otherwise, follow the recipe exactly as below.